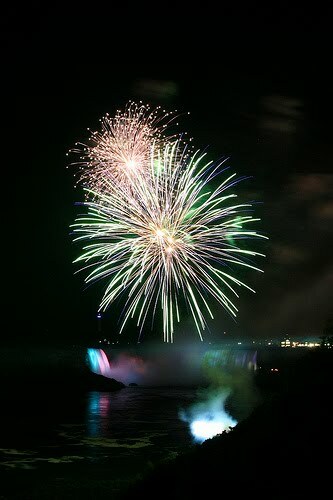 If you thought seeing Niagara Falls was spectacular, wait till you've seen them lit up by fireworks. From now until mid October, on every Friday, Saturday and holiday evening, there will be a fireworks show startng at 10 pm and preceded by a free concert that starts at 8. So come early, find a comfortable spot beside the river, enjoy the music and thrill to the colurs and noise of a great fireworks display. Who took that nice fireworks pic?